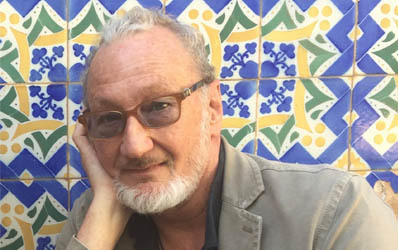 As the quick-witted, well-toasted, sweater-wearing, child-killing, sharp-clawed Freddy Krueger in the A Nightmare on Elm Street franchise, Robert Englund is one scary dude. But when the 68-year-old actor strolls the glorious backyard of his cottage-style Laguna Beach home, he cuts a less frightening figure. He points out some plants favored by his wife, Nancy, who is on the board at the Laguna Beach Garden Club. He checks on the fish and a turtle that live in their koi pond. He calms their rescue dog, Maizy, who is going bonkers over some visitors. The Englunds moved here from Los Angeles in 1989, when they bought their 1920s home from two National Geographic photographers. Though they considered settling down in Italy or La Jolla, or spending more time at their second home in Santa Fe, Englund’s memories of Laguna and the Fourth of July view they now have from their roof swayed their decision.